Hey everyone! 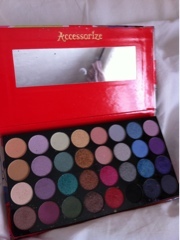 So today I am doing a review on the Accessorize You Are Everything Palette. This palette caught my initially due to the gorgeous cover! 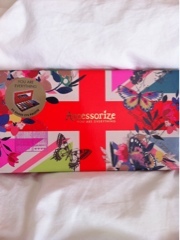 Its covered in butterflies, flowers and a union jack! So pretty! It has a handy mirror and is a good size! There are 32 shades! Yep you heard me right 32!! The selection is fantastic, 8 rows of tones starting from shades of brown through to purple, as you can see from the photo, you can start with a base colour at the too and work to bottom of the row for the colour to add to the edge of your lid. The colours go on easily, no need to keep repeating application! The pigmentation is fantastic! It truely does last and has a depth of colour. See my Fifty Shades Of Colour posts for swatches. Definately! I will repurchase this! It was only £6.99 and for the amount and quality I feel this is value for money! 9/10! One less as it couldve had a bigger mirror, but guess thats just picky!